It is Saraswati Puja today Mi…and here we were, assuming it was tomorrow. Result? Not ready to celebrate! Can you imagine? Because we haven’t shopped for all the trappings​ – flowers, fruits, etc etc. Then Vidur suggested we celebrate it tomorrow. Yes, aren’t we great at rescheduling things according to our convenience? So we’ve decided to go by that. In the meantime, work IS worship, right? Yep. So we were up bright and early and went ahead with our plan of cleaning up the house. With all the stuff we’ve been up to the past couple of weeks we didn’t have time to do the festival sprucing up. We’ve started off today – also, I am conscious of giving myself until October 31 to donate, dispose or decide what to do with a lot of our stuff. Crazy how it all piles up. Did I tell you that we did a Lakshmi Puja as part of the Navaratri celebrations last Sunday? I made kabuli chana sundal for the prasadam and after the puja they all sang happy birthday to me. So sweet! Then there’s the visiting for golu and vethla paak. By the way, these days, most people invite via email or the phone. Remember how you used to be amused about people not bringing kum kum to invite? Now they’ve done away with the coming home and inviting. If we bump into each other outside, well and good. If not – phone or text or Facebook message! Oh, how can I forget WhatsApp! Far cry from those days when we would plan ahead, make lists of whom to invite for the golu – what to wear, which sundals to make every day. Even more exciting, practice with our song books as we were expected to sing in all the houses we visited. Also, we’d visit people every day. Now they only invite on a particular day. Lifestyle changes – and who has the time or patience to entertain guests consistently for 9 days, eh? The dolls are so expensive this year. I was shocked to see sets of dolls for Rs.5000 upward! I was secretly worrying over how they’ll store it you know – the dolls have to be preserved carefully and kept safe for a whole year before they are out again and joined by a new collection! But what a joy it is to see golus – I have such lovely fond memories of those days in Kalyan Nivas when we kept 16 steps! What a wonderful family activity it was – getting all the trunks down from the attic and unwrapping the dolls – and then touching up the ones that needed a makeover with paint. That Krishna statue went through so many transformations at home! Wonder where it is now! Strangely I am not guilty about postponing the celebrations to tomorrow. Of course I will sneakily make payasam and do the neivedyam today. Atoning for forgetting. Cha! How could I not look at our Murugan daily calendar! When Sury tore off yesterday’s date and read out what was written on today’s sheet as usual, we all had a bit of a jolt. God lives in our house throughout the year, eh? Especially Saraswati, Mi. So what if I don’t use the name. I was christened Vidya Saraswati, no? For my part, I am happy we had our coffee together this morning! What can be better than that! Hi Mam, Happy Maha Ashtami! 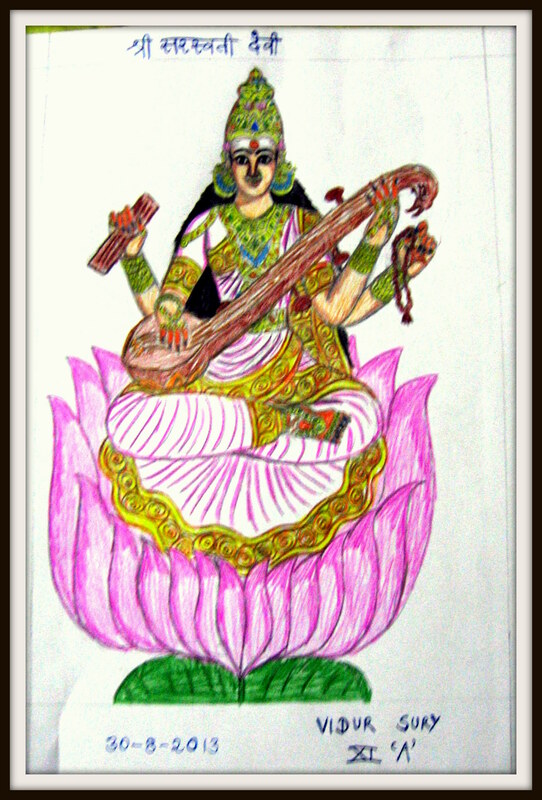 I celebrated Saraswati Pooja today. Hope you celebrate tomorrow as planned 🙂 Loved the sketch! !